When it comes to memorable cycling and athletic apparel, that’s what it’s all about. That’s why AK Apparel uses custom digital sublimation on every jersey we produce. 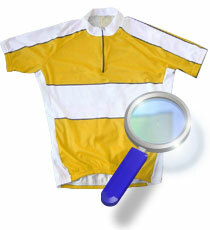 In the world of cycling and athletic apparel, sublimation means that dyes are heated and pressurized into gas, then transferred to fabric where they bond with individual fibers and cool to solid again. Traditional screen printing covers the fabric with a layer of ink that can peel and fade. Instead, your design is a permanent, integral part of your apparel. In traditional screen printing, that ink layer sits on top of the fabric, essentially “blocking its pores.” Sublimation, because it is a part of the fabric itself, does not impede the garment’s breathability and moisture wicking characteristics. Not all sublimation is created equal. Other companies offer screen or offset sublimation, while AK Apparel’s is fully digital. This offers you tremendous flexibility in color choice and design elements—even photo reproduction. It even takes the hassle out of the ordering and production process. Read more on our Why AK Apparel page. Simply put, to offer vivid design with long–lasting color and superior performance in cycling and athletic wear, nothing beats digital sublimation. That’s why it’s an AK Apparel standard.